Oh, how the man should be ashamed who follows the teaching of the devil and his own lower nature, caring more to gain and keep the riches of this world, which are all vain, and pass like the wind, than for his soul and his neighbor For while abiding in hate with his neighbor, he has hate by his side, since hate deprives him of divine charity. Surely he is foolish and blind, for he does not see that with the sword of hate to his neighbor he is killing himself. Therefore I beg you, and will that you follow Christ crucified, and love your neighbor’s salvation: proving that you follow the Lamb, who for hunger of His Father’s honor and the salvation of souls chose bodily death. … Care not if you lose from your worldly substance; for loss will be gain to you, provided that you reconcile your soul with your brother. Heavenly Father, your glory is in your saints. 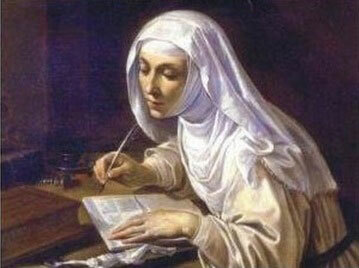 We praise your glory in the life of the admirable St. Catherine of Siena, virgin and doctor of the Church. Her whole life was a noble sacrifice inspired by an ardent love of Jesus, your unblemished Lamb. In troubled times she strenuously upheld the rights of His beloved spouse, The Church. Father, honor her merits and hear her prayers for each of us. Help us to pass unscathed through the corruption of this world, and to remain unshakably faithful to the church in word, deed, and example. Help us always to see in the Vicar of Christ an anchor in the storms of life, and a beacon of light to the harbor of your Love, in this dark night of your times and men’s souls. Grant also to each of us our special petition . . . (pause to pray for your own intentions). We ask this through Jesus, your Son, in the bond of the Holy Spirit. Amen. I do not want you to fall into weariness or confusion through any vexations that you might feel in your mind; but I want you to keep that good and holy and true faithful will which I know that God in His mercy has given you … Yes, I want that out of the shadows should issue knowledge of yourself, free from confusion…Reflect that through love He keeps your will good, and does not let it run by its own consent or pleasure after the suggestions of the devil. And so, through love, He has permitted to you and me and His other servants, the many vexations and deceits of the devil and fellow-creatures and our own flesh, solely in order that we might rise from negligence, and reach perfect zeal, true humility and most ardent charity: humility which comes from knowledge of self, and charity which comes from knowledge of the goodness of God. There is the soul inspired and consumed by love. *Our Lord’s original words here were “heretics and schismatics,” since He spoke to Saint Faustina within the context of her times. As of the Second Vatican Council, Church authorities have seen fit not to use those designations in accordance with the explanation given in the Council’s Decree on Ecumenism (n.3). Every pope since the Council has reaffirmed that usage. Saint Faustina herself, her heart always in harmony with the mind of the Church, most certainly would have agreed. When at one time, because of the decisions of her superiors and father confessor, she was not able to execute Our Lord’s inspirations and orders, she declared: “I will follow Your will insofar as You will permit me to do so through Your representative. O my Jesus ” I give priority to the voice of the Church over the voice with which You speak to me” (497). The Lord confirmed her action and praised her for it. Now, then, we must have light–otherwise it would not be enough. This light has to be the light of most holy faith. But the saints say that faith without works is dead. Therefore we need to exert ourselves virtuously all the time, and leave our childishness and vanities, and not behave any longer like worldly girls, but like faithful brides consecrated to Christ crucified; in this way we shall have a lamp, and oil, and light. Dearest daughter, contemplate the marvelous state of the soul who receives this bread of life, this food of angels, as she ought. When she receives this sacrament she lives in me and I in her. Just as the fish is in the sea and the sea in the fish, so am I in the soul and the soul in me, the sea of peace. Grace lives in such a soul because, having received this bread of life in grace, she lives in grace.